This is second lesson of WordPress tutorial for beginners. In the first chapter we discussed about WordPress basics and its alternatives in short WP. It also covered creating free blogs on WordPress.Com or hosting your own installation. In case ou missed first lesson and want to read below is the link. In this post I will cover installing WordPress in your own laptop or desktop.In case you do not want to install it in local and proceed with next lessons it is fine. Note the steps mentioned in this post is also applicable if you want to install it on Server. If you do not have one click WordPress hosting plan then part of this tutorial will help you. I will indicate the parts which you will need while discussing. Why install WordPress in Computer? There are several reasons of installing it on your desktop. In first lesson we saw WordPress.com installation. 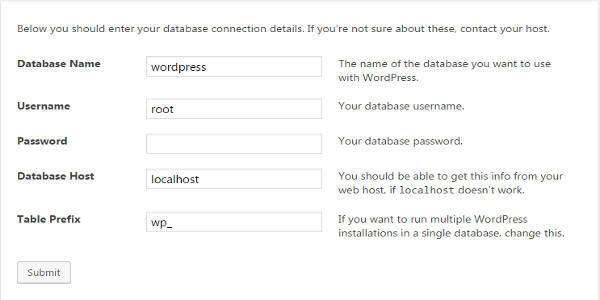 The back end of WordPress.Com installation is bit different than self hosted version. So it is easy for readers to get confused. I always recommend self hosted version. It gives you more control on your website or blog. I assume you will be using self hosted version. So it is better to learn it on self hosted version. There are several restrictions in free blog. During the course of next lessons those limitation may restrict you to try the lessons online. So it is better to create a self hosted version in local and read through the tutorials. A fresh site is always changed during initial time period. It is always better to test the change in local environment. After testing the changes or features you want in local (your desktop installation) you can try it on live site. For this also you need a local installation copy. This step is not applicable if you are installing on server (your hosting company space). You need Apache server,PHP and MySQL to run WordPress.These packages come bundled together in different packages . In this article I will be covering Windows Operating System as it is most popular. The process for Mac will be similar. But if you are Linux user then you can post your question. 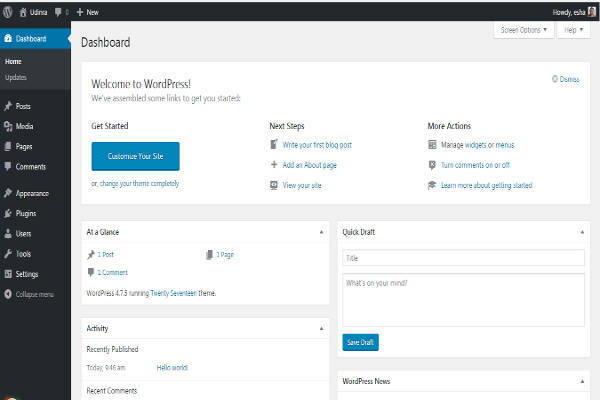 There are several free packages which can be used to host WordPress on your laptop. Below is brief details of the package in order of my preference. Note installation process of these packages is same as other Windows or Mac or Linux application. So I will not cover package installation in this post. In case you have any questions feel free to ask. Note the packages are more or less same. There is nothing like which one is good or bad. It is my time using them that defined the preference. You can select any one of them. This has become my favorite because of ease of installation and simplicity.It is also free and installation is pretty simple. It support only Windows operating system. The installation process is just like any other Windows application. You can download the package from this link. Make sure to download the latest version. This package is also available for Windows. If you are not comfortable with first option you can install this one. You can download the installer from this link. You can download any of the first two installer options mentioned on this link. XAMPP is available for Windows, Mac and Linux. So if you are using Mac or Linux this is the package for you. You can download the package from this link. The installation process on all three operating systems is same. After installing package of your choice we can proceed with next steps of installing WordPress. 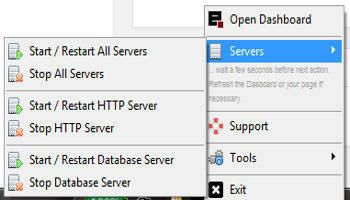 These steps are same for Server (hosting company space) and your desktop. The second step is not required if you are installing on server. You can download it from this link. After downloading extract the zip folder. You have to copy the extracted files inside the WordPress folder. Based on the package you installed above the paste directory will be different. Before pasting you can delete everything inside the directory mentioned below. If you are installing on your hosting server then copy it to public directory ( web root directory) of your server. You can do it using cPanel. Most shared hosting companies provide cPanel. I have written separate article on cPanel. In the default installation folder for all packages you will find exe files to start the servers. Run the exe files to start the server. This is important. In case of EasyPHP the exe file name is (run-devserver). You can test whether the servers are running or not. On the right corner of your Start bar. You will see EasyPHP. Click on Start / Restart all servers. It will restart all servers if not yet already. EasyPHP and other packages come with PhpMYAdmin. It is front end to control MySQL. You need to create database using PhpMyAdmin. It is very important for Blogger to learn some functionalities of this tool. This tool is also present in all hosting options. You can read my tutorial on PhpMyAdmin for this step. I am not reproducing the steps in this post. Note PhpMyAdmin is same for hosting companies and the ones installed on the local computer. You can use cPanel interface to create database on hosting servers. I have explained the process in cPanel tutorial ink shared above. The first step is to open localhost in your web browser. After opening localhost in web browser you can see below screen. On this screen you can see option to select language. 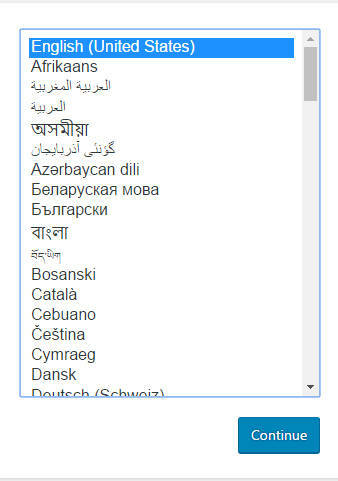 You can select language i which your blog or website will be. Note for hosting sites you need to open your domain name instead of localhost. The rest of procedure remains same for desktop computer and hosting site. After click on button Continue you will see next screen with Go button. Click on the Go button and you will see the third screen. Enter the database you created using PhpMyAdmin in Database Name text box. In place of user name it will be root in lower case as shown in the image. The password field will be blanks. Table prefix will be wp_ as shown in image. Click on the Submit button. On the next screen you will see button Run the Install. Click on the button run the install. You will page as shown below. Site Title – Name of you site. If you are not sure enter anything. We can change it later. Username – Enter the name using which you will blog on the website. 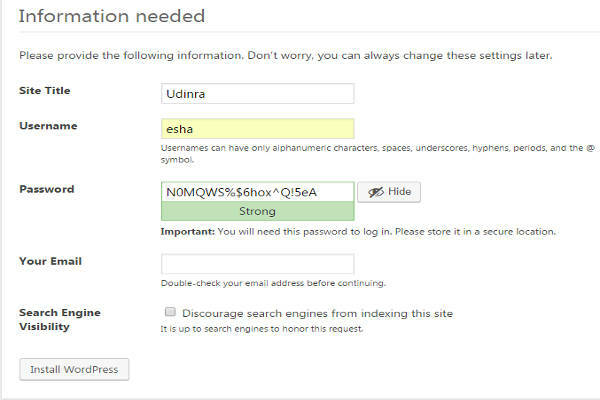 Password – Most sites are hacked due to weak password. So enter something complex here. Your Email – Enter any valid email address. After making above changes Click on the Install WordPress button. That’s is it. You have successfully installed WordPress on your system. On the next screen you will see Log In button. On next screen you will see prompt for user name and password. Enter the user name and password and Log in. If you see above screen then your WordPress website is ready. You can now add content on your site. In the next series of chapters we will discuss everything WordPress you need to now for building an awesome website. In chapter 3 of this tutorial we will discuss above page you saw. It will give you idea of the page and make you comfortable.